Orange Peel Cleaner is great. I just started making some. You save up all your orange peels. We eat so many we can fill it up quickly. If you need to save them up- freeze them till you need the peels. 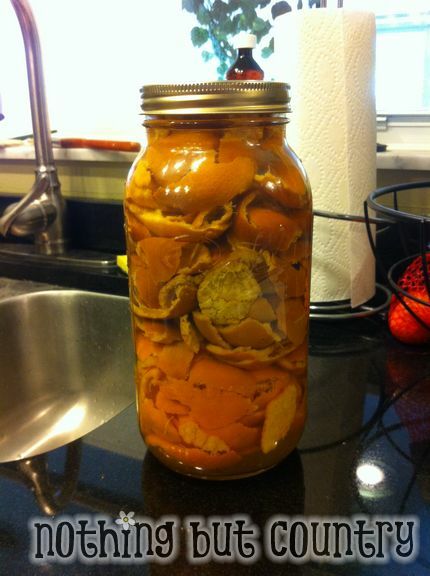 Once you can fill a jar up with peels then pour in enough vinegar to cover them all. Make sure the lid is on tight. Sake it up ever so often. I leave this on my window sill in my kitchen so I see it. Its rather pretty and makes me feel like Martha Stewart. Shake it up- and let it sit for at LEAST 2 weeks. However the longer you let it sit the better. Once you let it sit a while- the vinegar gets syrupy . Then when you are ready to mix up your cleaner- you strain out all the liquid. Toss the orange peels in your compost or whatever you want to do with them.